Do you think you should blame God for anything? I cannot possibly put a number on how many times I have heard people of all stripes blamed God for tragic events that have occurred in their lives. It is a common practice for people to blame God for unexpected tragedy or natural disaster. Christian or secular, the question is always; why? Why did God allow this or that? Why did God send this or that? Why? Why? Why didn’t God stop this or that? Some people even attempt to use tragic events to prove there is no God. Frankly speaking, I do not think you should blame God for anything. He is a fair and just God, and whatever He promises He will do. In the days of Noah, He promised a great flood and the flood came. 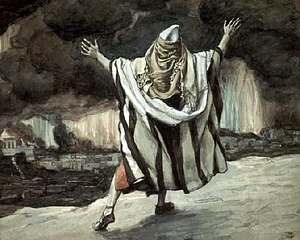 In the days of Abraham, He promised to destroy Sodom and He did. God never promised us earthquakes, and tornadoes, typhoons and tsunami. He never promised diseases—heart attack, brain tumor or cancer. He promises eternal life and eternal damnation: “For the wages of sin is death; but the gift of God is eternal life through Jesus Christ our Lord” (John 6:23). “Do not be amazed at this, for a time is coming when all who are in their graves will hear his voice and come out—those who have done good will rise to live, and those who have done evil will rise to be condemned” (John 5:28-29). Recently I stumbled upon a religious radio program—just in time to hear the preacher‘s comments on a friend of his whose wife was stricken with cancer. The preacher stated that his friend approached him and asks him why God allowed his wife to get cancer. His response was rather surprising! I thought he was going to say he did not know; as that would have been my choice, and the easy way out. Instead, the preacher said he told his friend that sickness and disease are not in God’s plan for us. He then quoted Jeremiah 29:11: “For I know the plans I have for you,” declares the LORD, “plans to prosper you and not to harm you, plans to give you hope and a future” (Jeremiah 29:11, NIV).That is reassuring? I thought to myself. I suddenly realized that all the myths and misconceptions about God are a result of lack of knowledge about God’s Word. God is a just God; He will never do anything that He did not promise. Tragedy and disaster brings misery but misery is not in God’s blueprint for us. Absolutely NOT! God’s desire for us is to show His LOVE. It is the adversary who is out to steal, kill and to destroy as John 10:10 states. Just yesterday during our homeschool, the kids and I looked at Noah and saw that God took care of him BECAUSE he obeyed God’s commandments. When we genuinely have confidence in Him and obey His Word and His voice, He will protect us. He is a gracious and loving Father. That is a great comment from some one who claims ill-preparedness. Your exactly correct. ” if My people who are called by My name will humble themselves, and pray and seek My face, and turn from their wicked ways, then I will hear from heaven, and will forgive their sin and heal their land” (Chronicles 7:14). People blame God because they chose not to listen to God’s instruction. I can tell you countless times God told me to do this and I chose to that. I can only blame myself for the struggles and hard times that occurred during the times I did not follow God’s instruction. And once I say, okay Lord, I’m listening, everything works out perfectly! Lesson of the day, Let go and let God, be obedient to God’s will and instructions. I agree with you Sakira. Your experiences are similar to mine. We are both witness of that fact. God is not like man. His promises are true. Thanks a lot for stopping by and leaving a comment. God blessyou. I don’t see “why” as always a bad thing. Depends on the person and the attitude behind the question. If a person truly wonders why God has “allowed” something, then maybe they will think on that and look for answers in the bible and/or from a Godly individual. Notice I said allowed, not caused. God allows many things that are not good, that does not mean He caused them. When people blame and accuse God, then I have a problem with what they say. I wonder why God allows some things sometimes myself. Quite often God “allows” things that are bad to get our attention because we did not listen to Him in the first place, or maybe it is to teach us something, mold us into someone with a little different perspective…then He uses that perspective we have learned in some way as we serve Him. I asked “why” did God allow so many bad things to happen to me…answer, because I did not listen to Him in the first place, and also…these things that happened to me are of great assistance to me in my ministry to young adults and older kids who are in juvenile facilities. Understand what I am saying here, God is never the cause of our problems, but He will “allow” many things to happen, and His reasons are always good. Does not matter that we can’t see or understand what He is doing, it is ours to walk by faith. Don’t get me wrong, I hate being honest, but I need it; I am called to it; Jesus demands it of me, and it brings healing and hope to others. I am going through a breakup, that might have been a God motivated thing, but there is no doubt that my choice to use my most skillful tool, anger, brought this thing to a crashing halt . What are my options? I have to turn my life over Christ, and allow him to work. He has already spoken to me about the end result, and I can only allow him to work this out. The other aspect of this has been my focus on God as my clear cut source and supply. My blogs are an outcropping of the result. Now, I have to ask myself, what is more important? My comfort, or the will of God. I truly feel like the Lord has been speaking to you loudly. He wants us to grow. Ozzie, I am speechless! All glory is due unto God. Wherever He leads I will follow. Thanks a million for your insight. You have been a big inspiration for me. Your timing is uncanny. For me that is. Wherever the spirit leads me that is where I go Betty. Our God is a God of love! He is love! He desires to see us prosper, and to have hope in Him! The disobedience of mankind, mankind walking in their own ways, is what causes so many disastrous events to overtake us. However, even when we get ourselves caught up in things that bring us ill will, God is merciful, and He will bring us out of some of those situations. Now that is a God of healing, and mercy! Thank you for sharing, Noel! Another wonderful message! God bless you! Thank you very much Minister Paulette. To God be the Glory! He is faithful and just, whatever He says he will do. “All we like sheep have gone astray; we have turned every one to his own way; and the LORD hath laid on him the iniquity of us all” (Isaiah 53:6).